The mountain village of Küstelberg is located to the northwest of Medebach, on the east slope of the Rothaarkamm, at an elevation of 650 to 830 metres. The landscapes in this area are characterised by ridges, vast plateaus and pristine nature. The picturesque town of Küstelberg is just a stone's throw from Winterberg and Willingen, so it's the perfect destination for your winter or summer holiday. Come spend your holiday in this new holiday house furnished in a modern design, which you will have entirely to yourself. 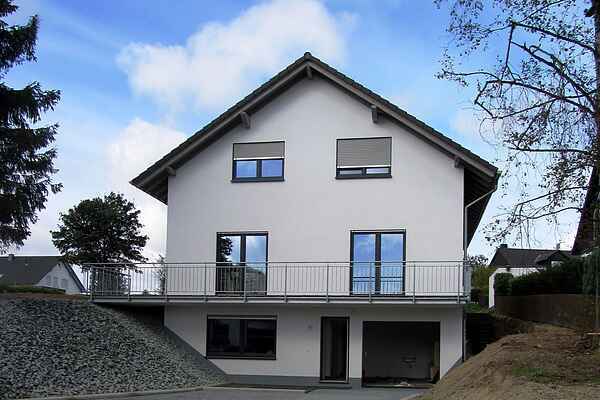 This detached holiday house offers plenty of space: a large living room with a balcony, a fully equipped kitchen, modern bathrooms and bright bedrooms. Both inside and out, the house offers ideal conditions for an enjoyable holiday with lots of variety. You also have a large garden (2,400m) with a sunbathing lawn, play area and terrace with garden furniture. Part of the house consists of a separate and fully equipped apartment on the bottom floor, which has its own entrance. Whether looking for an active holiday or pure relaxation, alone or with the whole family - there is something for everyone here. Medebach is a hospitable holiday region that offers a wide range of options for a holiday with lots of activity: over 500 km of hiking trails, 140 km of bike paths, a winter sport area with 2 ski slopes and 3 cross-country ski trails, a Center Parcs attraction, a high ropes course, a water park and much more. Favourite daytrip destinations: Korbach, Willingen, Winterberg, Hallenberg, Fort Fun, Edersee, Diemelsee, Kellerwald-Edersee national park centre.